This photo has been published before but the caption written by hand on the front of it on the copy we originally saw did not make sense. It seemed to suggest that this damage was from a flood in 1898. We searched everywhere for a ravaging flood in that year and could not find one. Then we were studying photos in the University of Washington system and found this one; the caption explains it all and suggests even more. 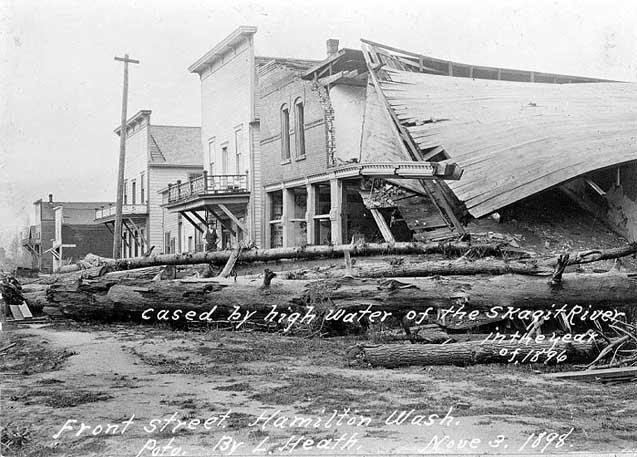 The scene is on Water street in Hamilton, which is now, in 2003, at the very edge of the north shore of the Skagit river or possibly underwater. If you go to that location today at the foot of Cumberland street, south of present-day Hamilton, you will find gravel and potholes and a great view across the river of second-growth forest where the South Hamilton School once stood. The flood of 1896 surely inflicted damage like this and the 1897 was even more destructive to Hamilton and the upriver town of Sauk City, which was literally swept into the river. Note two interesting items in the photo. One is the building at the center, the third façade toward the rear. That is the Yellowstone Bar and Hotel, owned by Peter Jacobino, where Marshal Jake Woodring would be murdered on the sidewalk five years later. The other landmark is the pole at the left center, which was for either telegraph or electric power lines. Hopefully a reader can determine its purpose. It surely was not for a telephone line because that service would not come until 1909 when druggist James Smith and the Quackenbush sisters brought telephone service to Hamilton. We also hope that a reader can tell us who took the photo. One might ask why the damaged buildings still stood two years later. We surmise the reason to be that Hamilton was suffering from the collapse of a boom and the hopes for mines on Coal Mountain and Iron Mountain on the south shore of the river. The country went through a crushing Depression in 1893-96 that was especially hard on frontier boomtowns such as Hamilton, which just seven years before was touted in newspapers as far away as New York City as the "Pittsburgh of the West." Apparently Jacobino and the other property owners left the shattered hulk of the flood-damaged buildings just as they were when the flood swept through on Nov. 16, 1896. As always, we are grateful to Larry Kunzler and his book, Skagit River Valley, the Disaster Waiting to Happen. On Wednesday of last week [Nov. 11] the wind began to blow from the southeast and, before evening, had developed into a chinook gale. Unfortunately for the river bottom settlers of the Skagit valley, this warm wind continued until about 4 p.m. Sunday. On Friday the Skagit began to rise rapidly and continued rising at an average rate of 3 inches an hour until Sunday morning when it began to abate. In the afternoon of that day, the river had risen [above] all previous high water marks [until old-] Sedro was one foot, 7 inches under water. Hamilton was totally inundated, one brick building having caved in and several frame [buildings] torn from their foundations. The county bridges recently constructed were destroyed and the improved roads that had become the pride of the upper valley became an easy prey to the devastating waters. Lower Sedro [what we call [old-Sedro, by the river] suffered heavily. A large number of cattle and small stock perished and buildings, ruthlessly torn from their foundations, were cast hap-hazard amid the heaps of debris. We are indebted to Larry Kunzler, a friend since 1992, for his expertise about floods. He and his son Josef have assembled a terrific website about the history of the Skagit river itself. They have shared their exceptionally deep research by posting dozens of pages of excerpts from the Concrete Herald about the river, attempts to corral it plus many more subjects. Mortimer Cook's store that has weathered 15 years [actually 12] rose with the eddying waters and turned half way round before lodging against some trees and stumps. Fruitvale and Sterling, between Sedro-Woolley & Burlington, were completely inundated. Two barns stored with hay and feed were wrenched from their foundations and rushed down with the torrent, until striking the Great Northern railway bridge at Burlington, they were shattered and their contents strewn upon the waters, wended their hurried way oceanward. The large orchards of this district were badly damaged by logs and stumps that bent and broke the trees like pipestems. South Burlington sustained great damage. Houses and barns were undermined and toppled to the ground and the winter's supply which they contained scattered on the tide. The fencing of years and clearings that represented the toil of a decade were covered with the debris of the surrounding forest. At Avon, the dikes gave way in three places and the unrestrained torrent rushed pell mell through street and meadow, orchard and garden, tearing and washing until the oldest inhabitant would have to summon imagination to aid him in recognizing some of the old landmarks. West Mount Vernon is next in line of progress and received no favor from the impartial flood. The water , rising from 1-2 feet above the first floor of the dwellings, swept fences and everything movable with it. Among the miracles of the age was the ability of the residents of Mount Vernon proper to keep the dikes in shape to restrain the freshet [flood] from sweeping through the streets of the city. By heroic effort all day Saturday and the following night the main dike was strongly reinforced by three temporary ones, which action alone saved the city as the old one repeatedly gave way. Here we must stop, for aside from the meager reports of the general desolation wrought in Skagit City, Fir, Stanwood and the Olympia Marsh, we know nothing authentic as to the extent of looses of life or property. By the slender reports in we are satisfied that in comparison with former floods, last week's freshet will live in the minds of Skagit valley residents for many decades. The railroads were among the heavy losers by the freshet. The Great Northern track from the Burlington limits to the bridge across the Skagit was floated from its bed and the fill badly washed out. The bridge was pretty severely shaken but by the adding of a few new piles and the re-ballasting of the pier it will be rendered sale for traffic. At least one half of the Anacortes & Hamilton line [Seattle & Northern, which eventually became part of the Great Northern] is honeycombed and totally unfitted for travel. unless a big force is put on for repair work, it will be several weeks before any trains can pass over this line. The Seattle & International [later the Northern Pacific] sustained the least damage, owing to the river bottoms being mostly spanned by trestle work. Through traffic was resumed on this line Tuesday. There had been a heavy fall of snow in the mountains at the head of the valley and the strong chinook wind coming before this snow had become packed and frozen caused a great thaw, thus supplying an unusual volume of tributary water to the Skagit. To this fact is undoubtedly due the recent high freshet. 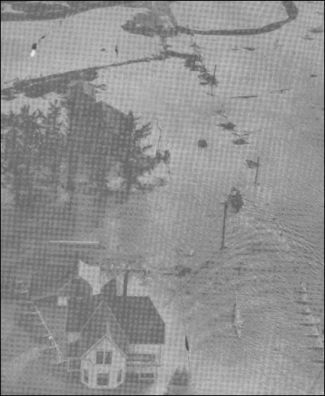 This aerial photo from 1949 shows the impact of the flood that year on this far near Cedardale, which was once on a slight slope with dray land all around. Town of Tingley [Day creek/Happy valley; the village there was then named after settler Samuel S. Tingley. ]: James Jameson lost one steer. School house District No. 61 thrown on its side, roof carried off. Sedro: Mortimer Cook store moved from foundations out to the road. Hay stored in warehouse badly damaged. Donnelly Bros. lost 8-10 hogs, two heifers. Geroge E. Jarvis lost a valuable two-year-old Jersey bull. Sterling: James Ritchford and family, who have been residing in the one-story cottage on the [Jesse] Ball homestead, were awakened on Saturday night by the roar of the waters as the freshet swept over the farm. After considerable shouting and firing of pistols, a rescuing party removed them to a place of safety. Mr. Ritchford lost his hay, cattle and five hives of bees. Frank Brousseau lost 2 head of cattle, considerable farm damage. Roads here are honeycombed but maybe repaired for about $125. Taylor McRae's property recently purchased from James McLellan was considerably damaged and the fences torn away. Other notes from this issue: Page 1. Sedro-Woolley awoke on Wednesday morning to find the townsite covered with a thin blanket of the "mantle beautiful." Page 1. First freight train from Seattle over S&I [Seattle & International, the interim name between the original Seattle Lake Shore & Eastern and later, the Northern Pacific; north-south rails through Sedro-Woolley] rails last evening at 6 p.m. Page 2. Hamilton is a desolate looking place. The people look blue and they have a right to the look. The ferry gone, houses settled, furniture and carpets spoiled etc. The Seattle and Northern railroad is a honeycomb. All sidewalks in flooded part of town are gone or lodged against some stumpage . Cumberland street from Water to Maple was small river Sunday; boating considered fine sport by boys. Small flood visited Sat and Sun. Wind blew warm 36 hours, river rose rapidly. Water rose Saturday morning, by night streets in lower part cover by 3-4 feet. 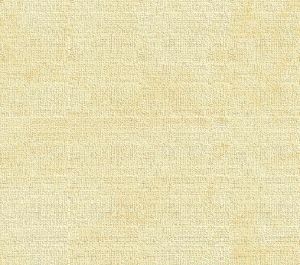 Page 1 Thos. Caskey has put his fine horse & buggy up for raffle for small sum $75. Tickets are on sale for 50 cents until all sold. See Sedro pioneer Joseph Hart's remarks on this flood and his incredible memory of conversations with very old Indians about floods long ago, in upcoming Issue 58 of our online Subscribers-paid magazine. Here's a peek: "See mud on tree — build higher." Skagit valley soil rated best in the nation, 1940. This story will soon be changed to this address. If neither file connects, please email us. Larry Kunzler has spent years researching flood control in Skagit county, both for clients and to help farmers understand the wrath of the Skagit river. He speaks from first-hand experience because he bought a farm in the Nookachamps area and learned a hard lesson. As he explains, he asked the realtor why the house was built 6 feet off the ground and the realtor replied, "That's because it used to flood around here. But now we have dams on the river and it doesn't flood anymore." Now that the Avon Bypass is becoming a topic of conversation again, Larry has transcribed the Herzog report and the original documents about the bypass that are eye-opening. You can email mailto:floodway@nwlink.com him to learn more yourself. Skagit River Past & Present, an introduction to the river section. The Mother of all Floods, 1815 through the twin floods of 1896-97 and the two November 1990 floods that may have been the worst in tandem. Facts about the Skagit, from the Skagit Watershed Education Project of North Cascades Institute in Sedro-Woolley. This story will soon be changed to this address. If neither file connects, please email us. Kunzler helped Leonard Halverson and other Sterling/Nookachamps-area farmers research when they sued Skagit county to recover damages from the 1990 Thanksgiving flood, a 35 year event. See Halvorsen v. Skagit county online.